Cloud computing is an increasingly popular option for IT needs. How are businesses using this technology in 2017? From spending to security, Clutch analyzes current and future trends. Over the past few years, cloud computing has solidified its importance in modern IT environments. While many once treated the technology with skepticism, it is now frequently the preferred tool for businesses when storing data. Where exactly does this fast-paced technology stand with businesses, and where is it going in the future? 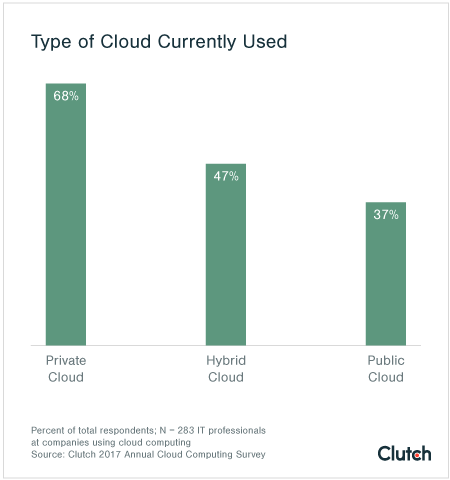 In our Second Annual Cloud Computing Survey, Clutch surveyed 283 IT professionals at businesses across the United States that currently use a cloud computing service. Using this data, we explore businesses’ current opinions and habits – as well as future industry trends – when it comes to the cloud. Over two-thirds (67%) of businesses plan to increase their cloud computing spending in 2017, indicating high desire for the technology. Nearly half of businesses (47%) list “increased cost” as a challenge encountered with their cloud provider in the past year. Security is ranked as a top benefit of using the cloud, indicating a shift in opinion from past negative feelings toward cloud security. Over 80% of businesses that aren’t using a hybrid cloud are exploring it as a future option, though a private cloud remains the most popular option. The majority of businesses hire an external consulting firm to help them implement their cloud strategy. 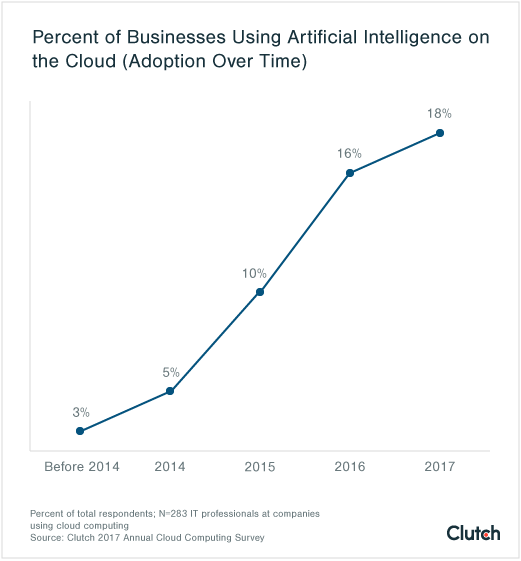 Nearly 1 in 5 businesses using a cloud computing service are using artificial intelligence features. Businesses are putting more money towards the cloud in 2017. However, this increased spending may be due to a variety of factors, from a greater desire to use the cloud to negligence regarding usage. Almost half of businesses expect their cloud computing to increase by 11-30% in 2017. Nearly 1 in 5 expect it to increase by more than 30%. Only 8% of businesses expect their cloud computing spending to decrease in 2017. Jeremy Przygode, CEO of Stratalux, Inc., a California-based Amazon Web Services (AWS) Advanced Consulting Partner and Managed Service Provider, spoke of the inevitability of businesses moving to the cloud. As the cloud gains popularity, businesses are perhaps less likely to see it as an alternative option, but rather as the logical next step for their data storage. Therefore, they will increase their spending in the technology. 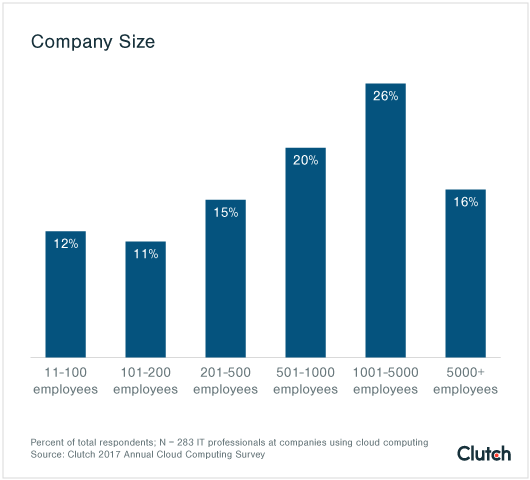 Clutch’s survey found that the largest percentage of businesses listed “increased cost” as a challenge they encountered with their cloud provider in the past year. This suggests that, in some cases, the increased spending is perhaps not always intentional or wanted. The reality of cloud computing’s mechanisms means that businesses may end up paying more than they expected. Cloud computing prices look cheap, sometimes advertised at just fractions of a cent per hour for a certain amount of storage. However, if usage surges, then those prices can jump up dramatically. Przygode spoke of the challenge of cloud computing price fluctuations. Haresh Kumbhani, the Founder and CEO of Zymr, Inc., a San Francisco-based cloud consulting and agile software development services company, also spoke of the relationship between scaling computing power and cost. You can alleviate this increase in price through proper monitoring, however. “That surge happens because they’ve chosen the auto-scale option and didn’t tune the policies which govern these costs,” Kumbhani explained. Proper governance means cloud computing can work for your business, within your budget. If you look at past articles on the cloud, you may notice a tendency towards skepticism regarding the cloud’s security. This skepticism was also fueled by high-profile hacks, such as the iCloud storage celebrity photo hack of 2014. Cloud computing is grounded in the innovative idea of sharing computer processing power; your data will cohabit with others’ data on the same servers. This idea understandably generated suspicion when it was first developed. 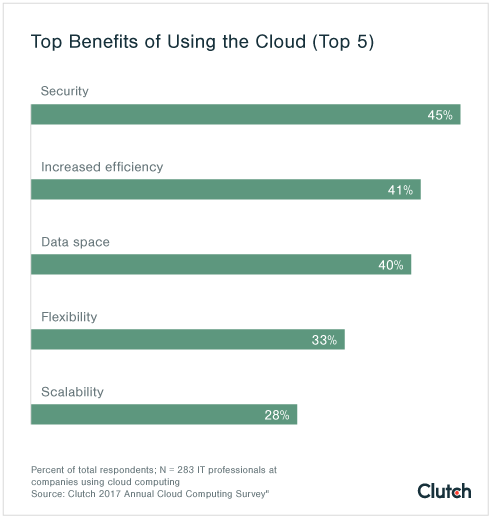 Now, however, the largest percentage of respondents listed “security” as a benefit of using the cloud. This comfort with cloud security hasn’t always existed. However, Przygode said that the suspicion towards cloud security may have been warranted in the technology’s early days. However, those types of fears are mostly unwarranted nowadays, and the cloud is often a more secure option. Physical security, such as protecting physical assets at a geographic location. Infrastructure security, such as ensuring security patches are updated as soon as possible, ports are scanned for abnormal behavior, etc. Data and access security, such as encrypting data, controlling user privileges, etc. In regards to the first two aspects, Kumbhani said that there is no better security than that of cloud providers, because the integrity of their business relies on protecting physical property and online infrastructure. However, the cloud providers have little control over the third aspect, data and access security. Rather, application-level security is more often the users’ responsibility. “Around 80% of breaches occur because this third part is not very well secured,” said Kumbhani. To alleviate this risk, he recommends clients encrypt their data and databases, ensure users privileges are correct, and deploy features such as cybersecurity scanners that monitor for threat scenarios. Cloud security has come a long way over the years. It is a secure option for data storage in most cases – perhaps more secure than legacy systems. However, the security is only strong as long as the user fulfills the responsibility on their side as well. Cloud usage is currently split between three types: public, private and hybrid clouds. What is the difference? Public Cloud: All services and infrastructure are provided off-site by the cloud provider. Private Cloud: Services and infrastructure are maintained on a private network. Data center architecture is provided by the company. Hybrid Cloud: A set-up that involves a mixture of the above two options. Currently, private cloud is the most popular option for businesses. However, cloud experts say that the public cloud will gain strength. For Przygode, the transition towards public cloud is an inevitability. However, the survey showed that a hybrid cloud is an increasingly attractive option, though. Over 80% of businesses that do not currently use a hybrid cloud are exploring it for the future. Hybrid cloud can be a good transition point for a business, according to Przygode. “Even if you are committed to a private cloud solution, a hybrid cloud solution can provide additional benefits where you can burst your workloads into the public cloud as needed,” he explained. This “burstability” means that even if cloud usage surges past average levels, then the public cloud can provide the CPU to manage that, as opposed to maxing out. This customization may be what a business needs. However, Rubin cautioned that the needs of small- to mid-sized businesses versus large enterprises are very different, and that each type of company should evaluate their specific needs before deciding between private, public, or hybrid cloud options. Implementing a cloud strategy may seem like an overwhelming task, especially considering the relative youth of the technology, and the small pool of institutional knowledge often available. 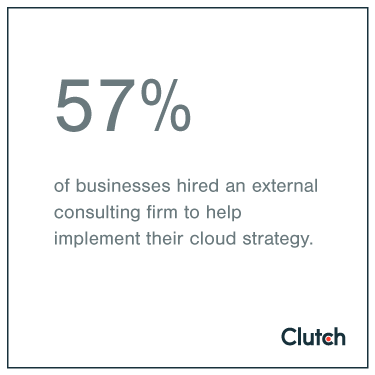 The majority of businesses hire an external consulting firm to help implement their cloud strategy. An external firm can help a business navigate the new IT frontier that comprises cloud computing. This dramatic change sometimes requires a wide variety of expertise to navigate. Due to the cloud’s complexity, an external firm may be the right choice unless your business already has significant cloud expertise. “You can do it yourself, but there’s definitely a learning curve, and you can do it a lot quicker and cheaper if you hire somebody who can manage it for you,” said Przygode. The decision comes down to the unique needs of your company, as well as resources available. Rubin mentioned the dichotomy between small- to mid-sized businesses and large enterprises. While large enterprises may be able to afford external help, small- to mid-sized businesses may need to wait to transition, or seek out lower priced options. No matter the size of your company, however, Rubin emphasized the need for pre-planning and careful organization. Expertise is required to mediate that shift properly, whether it comes from an external firm or within your company. In regards to the future of cloud, artificial intelligence (AI) may be an increasingly utilized feature. Artificial intelligence is a broad term, but it encompasses the concept of computer systems accomplishing tasks that previously required human intelligence. These tasks often involve complex analysis, perception, and decision-making, among other traits. The cloud can progressively power AI with larger computing power and data storage. The survey found that, of the businesses on the cloud, nearly 1 in 5 are using AI. Sixty percent of those businesses began using AI in 2015 or 2016. Ten percent began in 2017, between January and mid-May (when data was collected). Przygode said that AI capabilities are well-suited for the needs of the cloud. Artificial intelligence can be used to scan IT environments and analyze potential threats with greater efficiency. “As a Managed Services Provider, we monitor customers’ system utilization, availability, and workloads while providing 24/7 support,” said Przygode. “AI is a really good use case for finding the signal in the monitoring noise, because sometimes there might be alerts for an activity that is perfectly normal, but using AI we can filter alerts through machine learning algorithms and reduce false positives before they get escalated to our team. This makes for happier employees and customers." AI provides a potent platform for analysis and self-learning, while the cloud offers the opportunity for computing on a larger scale than previously possible. Moving forward, the intersection of these two technological fields could play out in powerful ways. Cloud computing is reaching new heights. 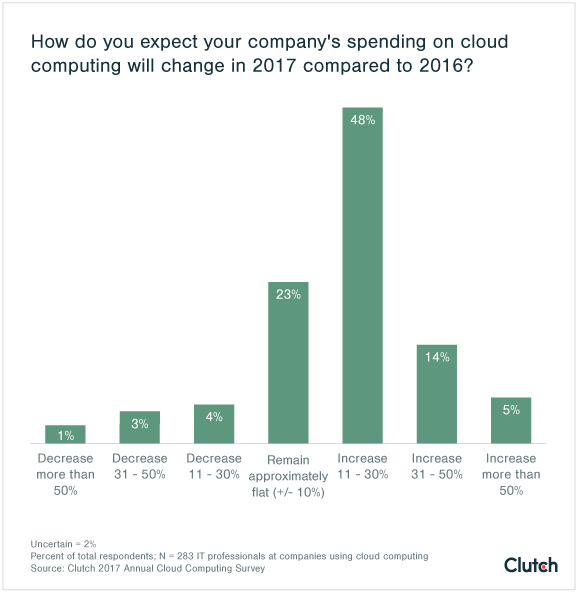 Clutch’s data shows that cloud computing spending will increase among the majority of businesses in 2017, and confidence in cloud security is strong. Furthermore, interest in a hybrid cloud is prevalent, as the option offers flexibility and customizability. Businesses are also exploring utilizing artificial intelligence on the cloud. Few will argue against the fact that cloud computing has upended the traditional IT market. As businesses explore their options for data management and storage in the future, it is important to understand the opinions and trends regarding cloud computing, and how this technology is evolving. The survey respondents consist of 283 IT professionals at businesses across the United States that use a cloud computing service. The majority (65%) of respondents are male, and 35% are female. Exactly three-quarters of the respondent pool is 25-44 years old. Questions? Comments? Contact Riley Panko at [email protected]. 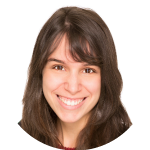 Riley Panko is a content developer and marketer at Clutch, a B2B research firm in the heart of Washington, DC. Her research focuses on the cloud. Reach out with questions, comments, or concerns at [email protected].